America found out late last night and early this morning that our 41st president, George H.W. Bush, has passed away at the age of 94. 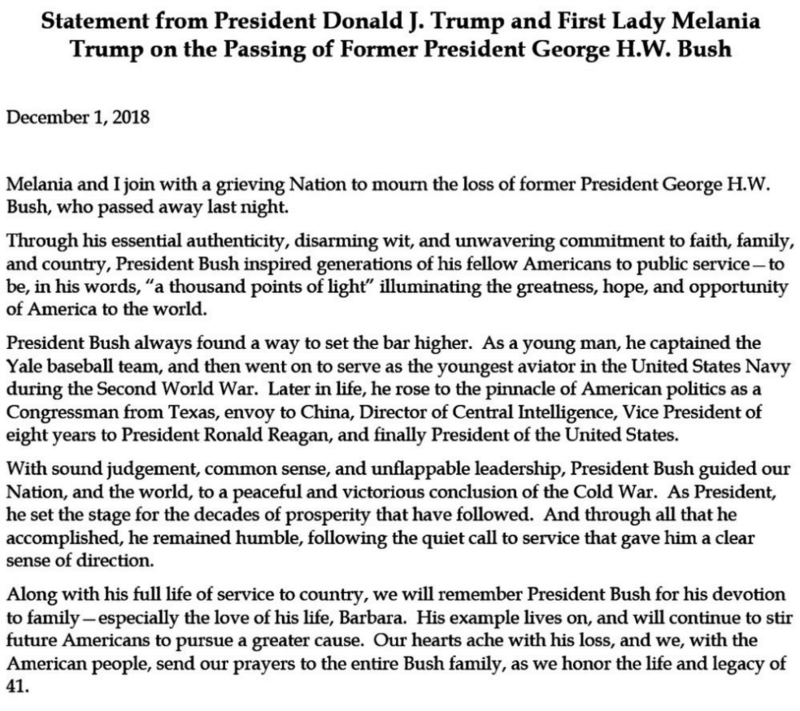 In traditional fashion, former and past presidents have already begun issuing statements of sorrow to the public, directed towards the former president’s family and loved one. President Bush did not attend Yale, much less play baseball for Yale, prior to serving in the Navy. It wasn’t until after he was honorably discharged from active duty in the Navy in September of 1945 that he enrolled at Yale University and joined the baseball team. Just days after graduating high school, on June 12, 1942, Bush, who had planned to go to Yale, enrolled in the Navy at 18 years of age instead. Bush was originally accepted for enrollment at Yale while completing his final year at Andover in high school. However, after Pearl Harbor was bombed Bush decided to join the military and fight for his country instead. While the error in Trump’s statement is no big deal, one would expect that both the White House would fact check their statements prior to releasing it to the public.